Have you ever wondered what it would be like to pack up everything you own, pick a destination hundreds of miles away, and set off on an open-ended adventure? What if you could do it all without giving up the comforts of home? 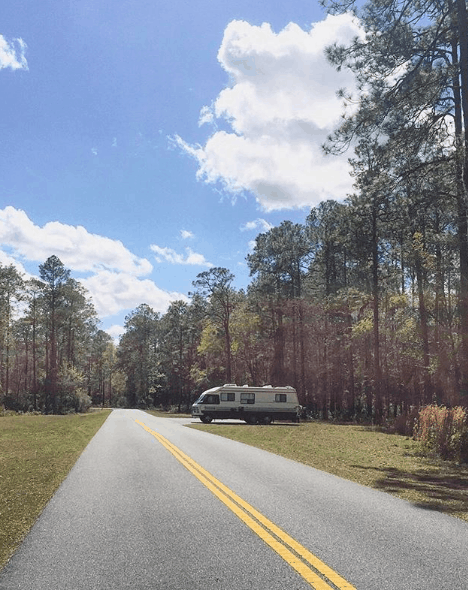 Several years ago, my husband, Kris, and I started to wonder, so we decided to take a serious look at our current lifestyle and finances to see if we could give this RV thing an honest go. Kris and I married in 2012 and started our life together in southern Virginia, where I was attending graduate school at the time. The following year, after graduation, I decided to pursue an organic farm school program in Asheville, NC. I lived half the week at our home and half the week in Asheville. The constant driving back and forth – four hours one way – was getting old. It’s where the very first thought of how nice it would be to have a mobile home started to creep in. Later that year, we decided to move back to PA to be closer to family and figure out the next steps for our lives. Before the move, I believed I would be getting a job offer that would get us on track to start bringing in some consistent income once we returned. So we moved back and in with his parents to get ready for the transition. The opportunity fell through and we ended up sleeping on the living room floor a few months longer than we had anticipated. However, with a bit of luck, we eventually found a small apartment above a garage that friends of the family had decided to rent out. We happily moved into our own place. It was during this time we both still felt a little restless. Not completely sure what it was that we wanted to do now that we were back home. We kept struggling with feeling out of place and not sure where to focus our energy. I had been wanting to travel for quite a few years, but it had always felt like a pipe dream when living paycheck to paycheck as a student. I eventually convinced Kris to dream with me and we would spend countless hours searching for fifth wheels and RVs. I was also quickly falling in love with the tiny house movement and as much as we loved the idea, we knew we didn’t have that kind of money for a build – let alone a place to park it. We quickly shelved the idea of the nomadic life and went back to life as usual. I hustled to pick up several part-time jobs, while Kris returned to his former employer. A year before we’d married, we had gone through Financial Peace University together and it had inspired us to at least create a budget. But that was as far as we got with the program at that point. It was during one of my five jobs that year that I re-discovered Dave Ramsey and FPU. I hit play on one of his podcast episodes and I was instantly hooked. I began to look forward to that five-hour courier route as I soaked in hour after hour of real-life inspiration from the archives. But it was when someone would call into the show to do their “debt-free scream” that I got really fired up. At least once an hour, someone would call in or visit the studio to share their story. They would share how much debt they paid off, how long it took them and wrap up with a countdown to yell “we’re debt free!” It put a fire in my belly and made me realize we didn’t have to live with finances being a burden. We could choose to do it differently. That was it. We finally had a goal. It was time to crush the several thousands of debt we had accumulated buying gear for our photography business, and annihilate the 35k in student loans. I was 28 and knew I had to be debt free by 30. Kris hopped right on board and we got serious. We examined every area of our spending, created customized grocery lists in excel so we knew exactly what we would spend at the store before we even left the house, and turned our date night into once-a-week progress check-ins. He took on as much overtime as possible at his job, and I added housecleaning into the mix of all my other jobs. We knew that we needed a new approach to defining our wants versus our needs. We also knew that if traveling was in our future, we would need to start consolidating our things. We had items stored in both our of parents’ basements that they were eager to unload. It wasn’t difficult to begin by paring down our clothing or all the extra kitchen items that seemed to multiply over the years, but it kind of stalled at that point. Especially when it came to sentimental items. 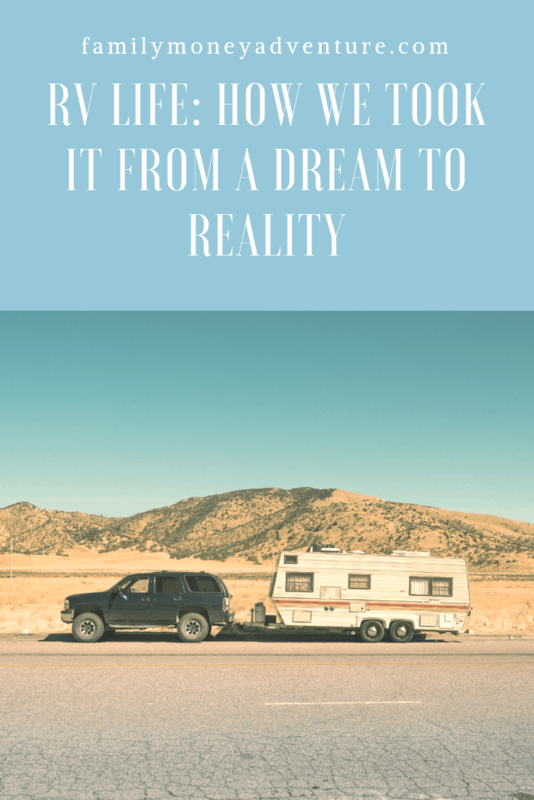 As we chipped away at the debt – little by little – we spent more time delving into blogs and learning about nomadic life. We spent any downtime we had searching Youtube for #vanlife videos. We studied different types of builds, estimated costs, projected how much savings we would need to venture out – all of it. It was tough to not lose momentum as the debt seemed to be an endless mountain, but the planning kept us pumped up and focused. After sixteen months, we achieved debt-free status! We were finally at ground zero. 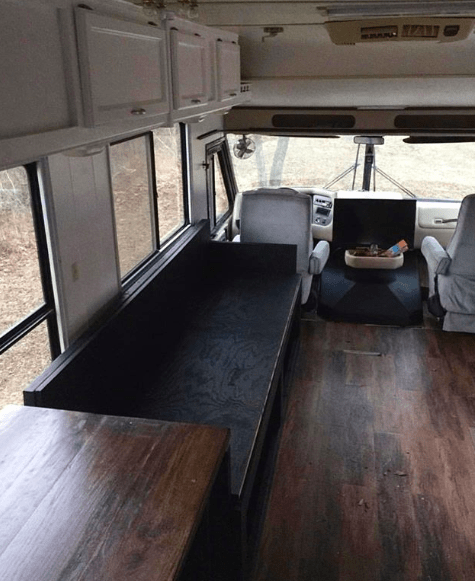 We began toying with the idea of a small RV again. It had a few more built-in conveniences than a van and would be a little easier to envision ourselves in long term. Especially if we decided to park somewhere for a few months. It would be another year of searching and saving until we finally found our 1989 Holiday Rambler. She looked every part of the year she was made, but had been garage kept and her Chevy 454 engine purred like a dream. We went back and forth on pricing negotiations with the dealer – eventually knocking $4,000 off the original asking price. We bought our rig in August of 2016 and spent several months working every free weekend we could. We tore out the carpets, the dinette, the annoying half-wall next to the couch… and the couch. We had planned to keep and cover the mattress, but once we found huge stains that soaked through all the way to the wooden frame, we tore out every inch of the bedroom and the smelly old, blue carpet. In total – our renovation came to about $4k, with $1k of that being the toilet. Truly our best investment ever. We could park anywhere for extended periods of time and not worry about a black tank. Could we have done a cheaper renovation? I’m sure of it. However, since we pretty much gutted it and started from scratch, we didn’t stress too much about the cost. All said and done, the total of the RV, a few repairs and reno costs still came to less than the cost to purchase a decent van – under $15k. Granted, what you will save in fuel costs with a van will be considerable, but at the end of the day, the RV was the right choice for us. Even at it’s gas-guzzling 6 MPG. In February of 2017, we finally set off on our journey! We could have a left a week earlier than we did, but we were so used to being in planning mode that we had a difficult time wrapping our head around what to do next. Were we just supposed to get in and… drive away? That’s exactly what we finally did! We set course for the south, eager to escape all signs of winter. We had pre-planned a budget and stayed the course in all areas except food. It took a little getting used to going from grocery shopping once or twice a month and storing endless amounts of food, to realizing we didn’t have that kind of space and would need to purchase fresh and frozen several times a week. Getting used to cooking in the smaller space was a little challenging as well, but we figured it out. Many people swear by the Instapot to make cooking even easier, but for no good reason, we still don’t have one. It’s tougher to store a lot of leftovers, but we eventually found a system and ended up eating a lot of soup to help cut down costs. We stayed in Walmart parking lots between destinations and hunted for state parks with solid online reviews. We knew we could make it about four days on our freshwater tanks and scheduled to stay at a park whenever it was time to refill. Our accommodation costs per week ranged from $100 – $150, with gas averaging about $100 a week. Only a little more than our monthly rent + utilities cost while living stationary. These costs are completely variable, though, depending on current gas prices, how far you plan to drive each week and how fancy of a park you decided to stay in. With a little research ahead of time, you can be sure to find some solid savings along the way. Other costs remained as they were before – phone, insurance, subscription fees. Although our phone bill went up a bit when we switched to an unlimited plan to make sure we could hotspot when wi-fi wasn’t available. RV life definitely took a bit of adjustment. Adjusting to the lack of consistent internet was probably the biggest challenge. If you are planning to be out long-term, this is one of the best resources for how to stay connected while on the road. We also had to be super conscious of our water usage and hot water levels so we didn’t run out in the middle of a shower, or so the gray tank wouldn’t back up into the shower from being too full. We also had to be sure to check and refill the engine oil frequently, give the old girl a break after driving for a while and remember to run our generator while we were driving to keep it functioning properly. But we loved every minute of it! Seeing new places, waking up with the bay directly outside our window some days, hiking through beautiful and warm locations during our usual winter season, meeting new people and hearing so many interesting stories about how they got started with this lifestyle and their dreams for the future. We designed our days around our preferred lifestyle and felt more connected and relaxed than we had in years. Kris and I often spent time brainstorming ideas for ways to diversify income streams and look for ways we could continue to cut costs. The plan was to head back to PA after a few months for our wedding photography season, and then head right back out again. Unfortunately, we ended up turning around a little sooner after developing an exhaust leak and having some issues with our generator. We circled up through Texas on our way back and parked in my parent’s driveway for the next 3 months. 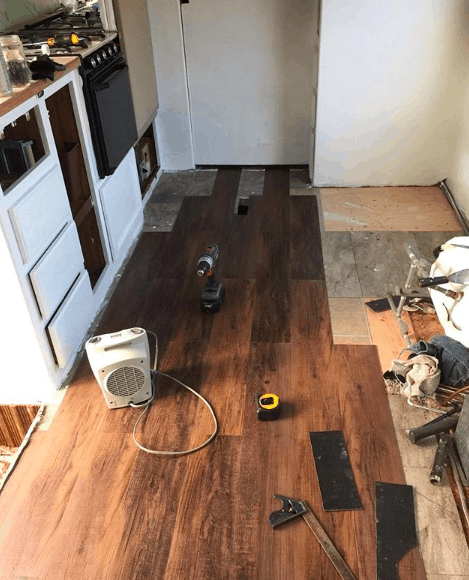 An opportunity came up for us to sublet an apartment while we completed some repairs to RV and touched up some of the projects we had rushed through the first time around. So we parked the rig and prepped for a winter at home. Months went by as we went back into saving and planning mode to get back out on the road, but as we talked through the details, we realized that we both wanted a smaller rig. As great as it was to have the almost 200 square feet of living space, we wanted to cut down on our fuel costs and take up less space when looking to dry camp (camping without hookups). We also wanted to work solar into our long term plan. In the process of deciding our next steps, we decided that we also wanted a home base of sorts. Since our approach has been to work and save and go out for extended periods, we needed a place to come back to in between. We happened across an adorable little house that we decided to purchase just last year. Several months later, we moved back into the RV in our backyard and invited some friends to live in the house and share the cost of living with us. This has been huge in helping us maximize our savings for future traveling. The current plan is to eventually turn the house into a rental unit and save up for a smaller, newer rig to take us on our next adventure! Oh, and our current rig is officially for sale if you are looking for something to get yourself started. She still runs great. While this is merely an abbreviated version of our story, I am sharing in hopes of inspiring you! Do you have a dream to travel, but are currently struggling with debt? Or, maybe you just can’t quite seem to save up enough to get a vehicle. Or, maybe you want to go, but feel guilty making this a priority – or feel nervous to leave your comfort zone? I am here to tell you to just go for it! It’s not nearly as difficult as we imagined it to be. There are so many resources out there and online communities to help you get started. In fact, I’ve included some of our favorites below! You will not regret stepping out into the unknown and pursuing this adventure. You will learn so much about yourself and what you are capable of. You will see so many beautiful parts of the country you never dreamed existed! You will feel more alive each and every day that you are set out to conquer the goal of making this dream a reality! If this is what you really want to do, you can’t let any excuses stand in your way. It took us 3 years from the start of the dream to reality, but every bit of the process was worth it! If you have any questions at all, we are happy to answer them over on Instagram. We hope to see you out on the open road by 2020! Hello! I’m kerah of kris + kerah. I’m the writer and social media pro, while kris is the hands-on project master. Together, we are wedding and portrait photographers, part-time RVer’s and lovers of simple and minimal living. We hope you’ll join us on our many life adventures at krisandkerah.life or @krisandkerah on Instagram. What about you? 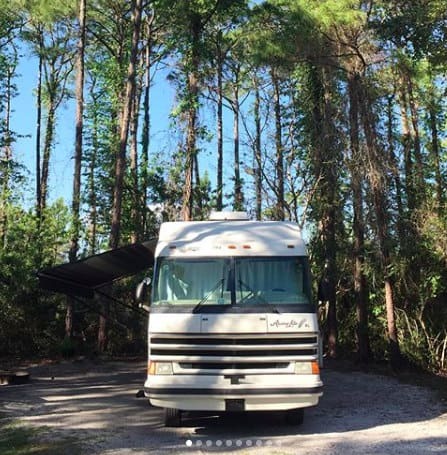 Is RV life part of your dream? Tell us what stage of the process you are currently in! Let us know in the comments below!